Dear theater friends, I need to tell you about an amazing performance--one that transformed the way I think about theater. This past Saturday, July 30, Hennepin Theatre Trust presented a Sensory Friendly production of Disney's The Lion King. Designed specifically for individuals with sensory, social and learning disabilities and their families, this performance is intended to provide families the opportunity to enjoy live theater in a welcoming and supportive environment. 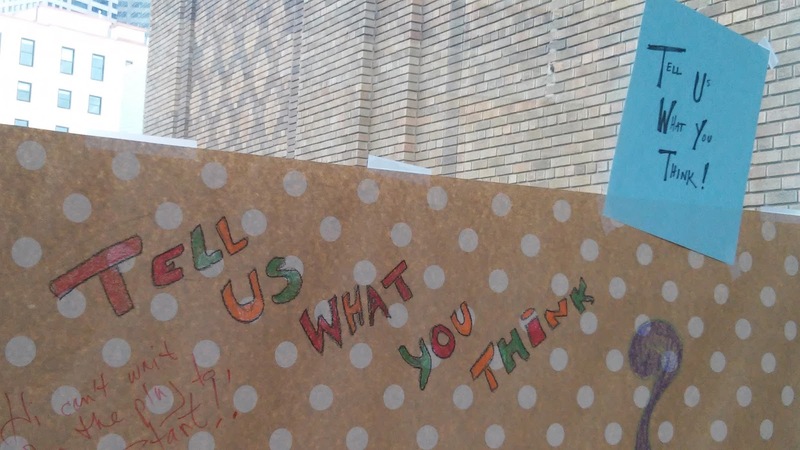 This welcoming and supportive environment began even before we reached the Orpheum Theater. Theatergoers were met on the street by smiling, trained volunteers in brightly colored HELPER tee shirts, standing near the theater to direct and welcome theatergoers. This was clearly not going to be an everyday trip to the theater. As we entered, we had a gentle security check of our bags. To the right, was a first aid station--to the left, the ever-popular merchandise stand. The concession bars were mostly closed (which helped with crowd management in the lobby) and the open ones appeared to just sell water and coffee. The women's restroom was transformed into a family restroom, and accessible restrooms were available and well-marked. 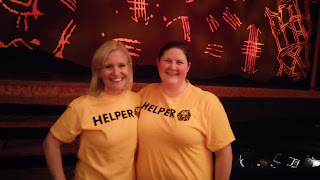 And everywhere you looked, smiling volunteers in HELPER tee shirts were ready to guide and help families. 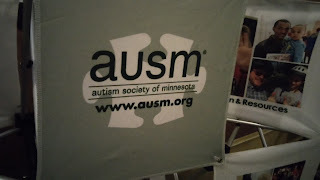 A table in the lobby from the Autism Society of Minnesota featured fidgets, noise cancelling ear muffs and a Social Narrative (picture book) called "We Are Going to the Theater" that takes participants through every element of their visit to the theater. Maps of the theater provided a floor-by-floor snapshot of all the resources--including restrooms, first aid and quiet areas--were readily available and prominently displayed. The friendly volunteers were actively and gently promoting and offering these items to families. An activity area in the skyway on the second floor (sponsored by Creative Kids Stuff and YOXO) had craft activities, boards where kids could write their feelings about the show, as well as snacks and juice boxes. Thought boards at the Activity Area. The theater also featured large screens in the lobby so that if families needed to exit the seating area, they could still see the show. As we entered the house, we saw still more volunteers. Although there were some empty seats (which seemed to be strategically spaced out), the theater was quite full. It was a pleasure to see that the outreach efforts were successful, and the Hennepin Theatre Trust certainly reached the target audience for this performance. Despite the fact that many of us volunteers are professionals in the special education and autism spectrum field, we did in fact have a two-hour training at the beginning of July. We also had many email communications during July to make sure we were well prepared. Two of the coolest things that were done, in my opinion, that you may not be aware of is that the Hennepin Theatre Trust hosted a "meet your seat" opportunity about a week ago so kids had the opportunity to get familiar with the space proper to the sensory rich show. And also on the webpage for this special performance was a link to a downloadable social story about the day of the show to help kids know what to expect. 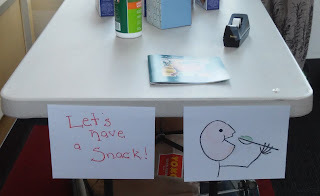 To me, these things (along with the free snacks and juice boxes, noise cancelling headphones, quiet spaces and active space) really put this event above and beyond! I love how accepting and supportive and thoughtful the whole process was! I really hope we have more in the future! The show went up a bit late, and the volunteers took their seats in the house, still at the ready to assist families. The house lights dimmed, but did not go completely dark. The show began and the audience's excitement was clearly evident. If you've seen The Lion King, you know that one of the most amazing spectacles in all of theater is the entrance of the animals in the "Circle of Life" number. 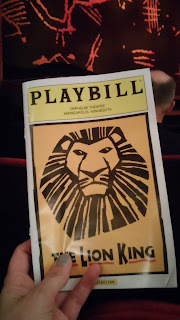 Personal sidebar: I was fortunate enough to see the very first World Premiere performance of Disney's The Lion King here in Minneapolis. I was in awe of all the Disney execs in suits I saw--I'm sure I saw Michael Eisner. We were seated in the back row of the main floor, and were some of the first people to see the animals entering through the house. The music, the amazing stagecraft, the beautiful voices, and the utterly thrilling originality ... I've never forgotten that moment and that feeling--not ever. And it was nineteen years ago. On Saturday, I saw something that even eclipsed this amazing moment. Because the house lights were at half, and because we were seated in the front rows, we had a beautiful view of the audience as we turned around to see the animals enter. And what we saw was a theater filled with wonder. We saw children and people who were in awe of the spectacle, and we saw parents and grandparents and volunteers and friends who were in tears. I think about it now and it still brings me to tears. It's one of the loveliest things I've ever seen in a theater. I'd love to know what the actors thought of this performance. It's unusual for them to perform in a half-lit theater, and they must see so much more of the audience than usual. The show has a number of scenes where the cast enters through the house, or comes down into the house, and it was wonderful to see the actors waving at children and making connections. Even Mufasa, entering through the house to yell at Simba, smiled at children with genuine warmth on his way. I'm saving the best for the last here. I want to share what it's like for a parent to attend this performance. Joe and Tahni Cullen attended with their son Josiah (see Josiah's Fire on Facebook), and Joe shared his thoughts (again, emphasis mine). My son Josiah is 10 years old and is on the autism spectrum. 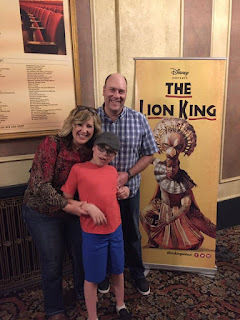 We’ve been fortunate to attend many sensory-friendly plays and movies throughout the Twin Cities over the last few years. He’s been to many productions now at the Children’s Theatre as well as some high school musicals too. When I first saw that The Lion King was back in town my first thought was how much my son would love it if only they had a sensory-friendly offering of it. Within a day I saw the advertisements for such a performance and our family was so excited. The production today certainly did not disappoint! We all enjoyed it, especially our son Josiah. He was clapping, laughing, and in awe the entire time. For us, these sensory-friendly productions are such a blessing. Josiah is usually well behaved in public but it just gives us the peace of mind that we’re in a non-judgmental environment…if he makes noise or is a little too wiggly, no one is going to mind. For instance today he seemed very fascinated with the hair on the lady’s head in front of him and tried touching it a few times. She turned and instead of a disapproving look she just smiled and said, “It’s no big deal. I totally understand.” We can just relax and enjoy the show. And from the smiles on Josiah’s face from the beginning to the end of The Lion King today I would say he definitely enjoyed it! He cracked us up at one point too. He doesn't have many words right now but at one point when Scar was up to no good he yelled out "No!" LOL! I had a hard time finding the right words to describe how amazing yesterday was for our family...and all the sensory friendly offerings for that matter. My wife and I met while doing plays together and college and we always imagined bringing our kids to plays one day. To have these opportunities has meant the world to us. Disney and the Hennepin Theatre Trust worked for months with a Sensory Advisory Committee of local Minnesota educators, therapists and community experts and partners such as Fraser, the Autism Society of Minnesota, and the Minnesota Autism Center, and received financial assistance from funders such as the Minnesota State Arts Board to make this special performance happen. 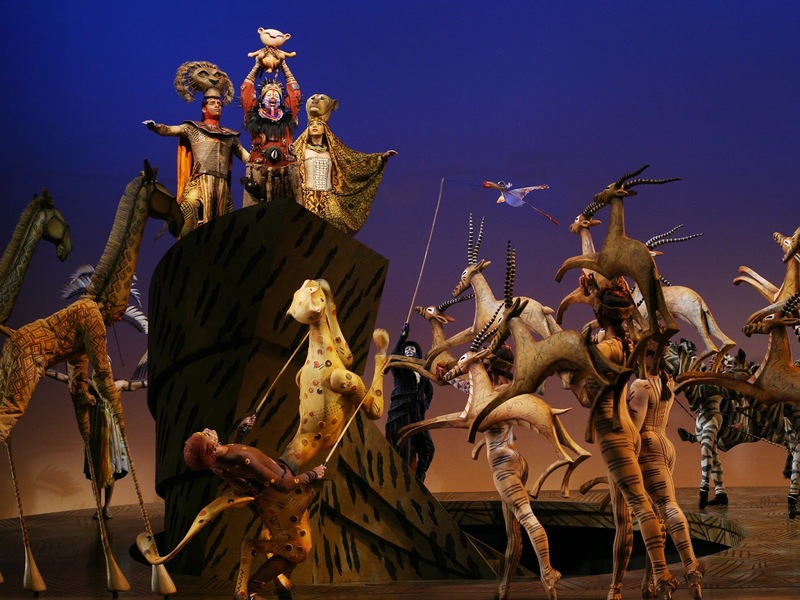 There is no doubt: Disney's The Lion King is a beautiful show. The cast is marvelous and sang, danced, and acted beautifully. The artistry and music is staggeringly creative and inventive. But more than anything, every element of this special performance displayed a kindness and inclusiveness that I don't often see in the theater, and certainly not enough in our everyday lives. The supportive, non-judgmental atmosphere at this show was astonishing--it will change the way I attend and view theater. Kudos to the Hennepin Theatre Trust, their partners, and to all of the marvelous volunteers who created such an amazing day. I hope to experience performances like this again and often, and I hope to see them at theaters that are welcoming audiences of all abilities. Interested in catching a Sensory Friendly theater performance? Check out the Sensory Friendly Performances at Children's Theatre Company and the 2016-17 Season at Stages Theater Company in Hopkins, MN. Find more Sensory Friendly Activities at the Autism Society of Minnesota's Community Events page, and all kinds of accessible arts events at VSA Minnesota: The State Organization on Arts and Disability.